CES 7th and 8th grade students did great work on this year's science fair projects! I want to thank McKinley Elementary School head custodian Brenda Gould for the outstanding work she has been doing organizing this year’s Wildcat Cafe events. This past week our Wildcats were kind enough to honor district administrators and board members. Brenda’s role includes sending out invitations, setting up, preparing students to honor their guests, and setting back up for instruction. The ongoing tradition of the Wildcat Cafe makes McKinley a fine neighborhood school! Last Thursday I participated as a judge in the Cañon Exploratory School grade 7-8 science fair. I was impressed with the quality of work accomplished by CES students. Projects I viewed included how hydraulics might work best on Mars, how to cheaply convert salt water into fresh water for drinking and watering plants, and what might be the best material to use for robotic arms. I truly enjoyed my time at the school and was excited to see such rigorous work completed by students. 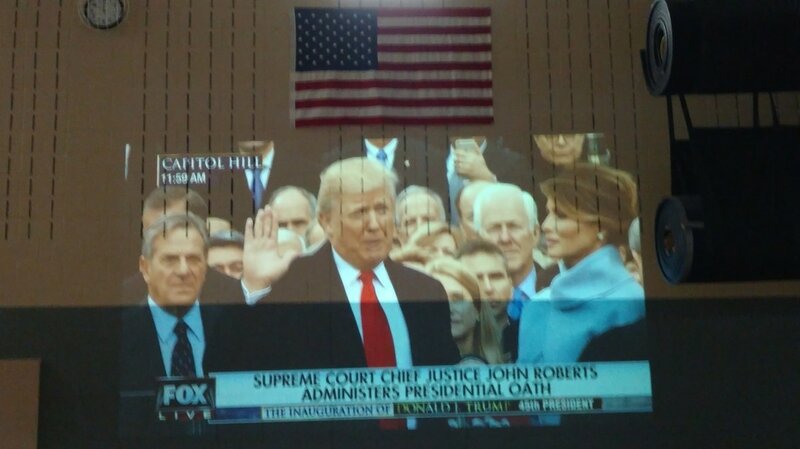 I want to thank the staff and administration of Harrison School for the effort put forth to offer the student body an opportunity to view the presidential inauguration ceremony. As a long time social studies teacher I can appreciate that, no matter which candidate we may have supported, the spectacle of the peaceful transfer of power as embodied through a presidential inauguration ceremony is worth teaching our students about. On a final note this week I want to thank Mary Hammer, our regional Junior Achievement representative, for making us aware JA has a highly detailed, and inexpensive, economics curriculum we can tap into as we develop new courses to offer at Cañon City High School next year. Last week Mary was kind enough to meet with CCHS social studies teachers Daniel Coppa and Chris Coppa about this. Mary Hammer discusses how Junior Achievement can support the instruction of economics content with Chris Coppa and Dan Coppa. Its January and this means our hard working building administrators and TOSAs are in the midst of conducting mid-year teacher evaluations. This is a gigantic task. As per Colorado state law, and our local master teacher agreement, all instructors in the Cañon City School District must receive preliminary evaluations each year before mid-February. This work is of utmost importance because doing so offers our teachers an opportunity to receive feedback about the great things they are doing, as well as advice as to how they might become even better. This timing also allows us to better support teachers who are struggling, by offering them clear guidance related to what they need to do better to meet the basic instructional needs of our children. Once these mid-year teacher evaluations are completed we’ll shift our attention to building evaluations. We began this process last year as a way of taking a comprehensive look at what each school is doing toward the achievement of its instructional vision. Periodically checking building progress allows for the district to measure whether or not a school is working toward the changes it committed to through its annual improvement process. Last year our building evaluations made it clear to us that McKinley Elementary was on track to no longer being a priority improvement school, something special was beginning to happen at CCMS, and we needed to take a serious look at the long term direction CCHS was headed. President Trump takes the oath of office. 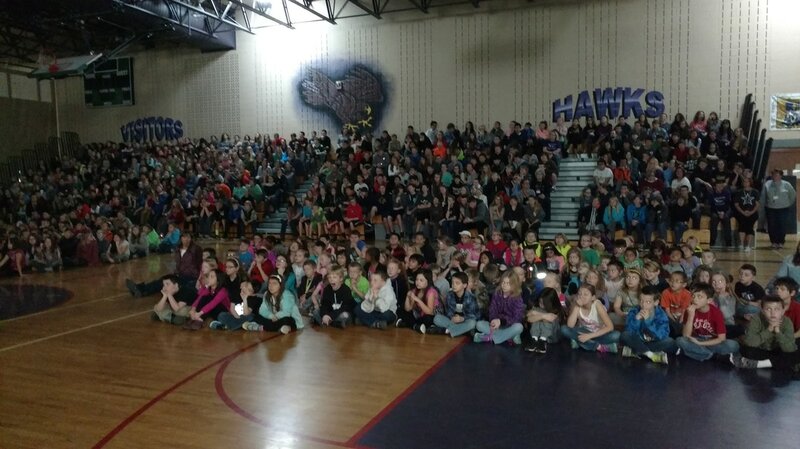 On Friday Harrison students assembled to observe the presidential inauguration ceremony. I began Monday meeting with some Harrison PTO officers, our regional health and wellness coordinator Kristi Elliott, and key folks (about the future of our Cañon Online Academy program). I also had a few employee and parent meetings, including a bi-monthly touching base meeting with district literacy coordinator Gina Gallegos. I ended the day attending Senator Grantham’s question and answer session at the city council chambers. On Tuesday morning I attended a SAC meeting, then conducted a monthly district leadership team meeting in the afternoon. On Wednesday morning I attended a meeting with classified association leaders and then I observed some delayed start professional development activities that took place around the district. The rest of my day was spent working on our BEST grant narrative. Most of my day Thursday was to be spent working on the BEST grant but many unexpected items hit my calendar. I also had my monthly touching meeting with Fremont County DHS executive director Steve Clifton. On Friday morning I had a Denver and back trip for legislative purposes, then spent my afternoon in the office attending to a few meetings and preparing my calendar for the coming week. The CCHS 5 block schedule is making it possible to offer many more exciting courses to students. I'll begin my week with another BEST grant narrative writing session, on Monday, then I’ll attend a district literacy team PLC, hold another touching base meeting with literacy coordinator Gina Gallegos, then end my day with a board work session and regular meeting. Tuesday will include SAC, Facilities Corp, and Communities That Care meetings, as well as an opportunity to connect with CDE personnel about our high school pathways transformation. On Wednesday morning I’ll be in Pueblo for a regional superintendent’s meeting, but I’ll return in time for our next technology visioning committee meeting. On Thursday I have a special education mediation meeting scheduled for most of the day, as well as a Cañon 2020 committee meeting and an evening meeting with community folks interested in possibly supporting a tax question that aimed at securing funds for our required match for any BEST grant we might secure. Friday will allow for another morning BEST grant writing session. In the afternoon I will participate in a meeting about possibly applying for a school based health center grant, and I will have a meeting about how to provide CES students with an instrumental music experience. Follow the green line to see how much Cañon City's per pupil funding has been reduced over the number of years the Negative Factor has been in place. During the past weeks I have done my best to help readers understand the global school finance issues in Colorado such as how funds are allocated to school districts, where dollars come from, and how Colorado compares to the rest of the United States when it comes to school finance efforts. This week I’ll share what this actually looks like in the Cañon City School District. The Great Recession led the state to impose the Negative Factor on school district funding mechanisms. As a result, Cañon City Schools receives approximately 3.5 million dollars less in funding per year than it would if the voter intent of Amendment 23 were still being adhered to. What is the result of this shortfall? Over the past seven years CCSD has had to eliminate a number of key positions, including counseling, teaching, paraprofessional, operations, and administrative staff. The result is a larger student to teacher ratio in classrooms, and a struggle to provide mental health and guidance counseling services to students. CCSD was also forced to reduce operating costs by closing several buildings (Madison Elementary and Garden Park High School), and reducing its investments in building improvement, technology renewal, and transportation upgrades. Most significantly, reduced funding has made it difficult for the district to update instructional materials at a time when Colorado has modernized its standards. This places our professional educators in situations where they must teach children while lacking the resources and support they need to do the job well. This chart shows how much our total program funding has been reduced since 2010 as a result of the Negative Factor. Despite creatively reducing expenses, for six straight years the district lacked funding to award teachers even one experience increase on its salary schedule. This means educators who worked as many as six years in the district, displaying loyalty to our children and improving their craft, got paid no more than a brand new teacher who enter the school system with no prior experience. Amazing work was accomplished last spring to begin remedying this situation, but without more dollars this trend will continue. We will risk losing high quality educators, and we are already finding it much more difficult to attract the best and brightest teachers to instruct our children. I have had two experiences since arriving in Cañon that illustrate our dire financial situation. First, in an attempt to secure facilities grant dollars last year we applied for a comprehensive Building Excellent Schools Today grant. We identified 11 million dollars worth of maintenance and repair needs. However, because we realized to have our best shot at receiving a grant we needed to take more time to ensure all the buildings we address would be useable long into the future, we backed away from a large grant application and limited our proposal to only a 1.4 million dollar roofing repair and increased entry security effort at a number of our schools. The school district is required to provide a 35% cash match for projects this size. While budgeting, we realized submitting such a grant would place our emergency facilities reserve at a dangerously low balance. We decreased our grant application to roofing projects totaling only $1 million because we couldn’t afford to access the dollars the state has set aside to help school districts like ours address pressing facilities needs. My second experience on this front comes from knowing, based on past experience, exactly what it will take to increase the reading proficiency of our most challenged students, yet coming to the realization we don’t have enough discretionary funding to put such a process in motion. What more important thing is there for a school system to do than to ensure all of its children can read at grade level? How horrible is it to come to the conclusion that we simply don’t have enough dollars to do so. Fortunately for our children we were able to compete for and secure a Colorado Early Literacy Grant, and thanks to this we are putting much of this good work in motion. We have not been sitting around complaining about our lack of funding. Last year we applied for and received a BEST grant in the neighborhood of 1 million dollars to repair our most needy roofs. We also secured the 1.5 million dollar Early Literacy Grant I just described, a $400,000 Counselor Corps grant we are using to guide students toward more authentic college and career choices, and a $350,000 Expelled and At-Risk Student Support grant that allowed us to implement work sessions and our new Alternative to Suspension program that is already improving learning and behavior outcomes. We also applied for and received a large Colorado Health Foundation grant ($330,000) that is making it possible for us to develop and implement a comprehensive K-12 health curriculum, a $325,000 School Health Professionals grant that allowed us to hire additional nurses and counselors, as well a number of smaller grants including one that will build a new playground on the CES campus. This is all great, and it is the exact work we should be doing on behalf of our taxpayers. However, all of this has had no impact on our ability to attract and retain excellent staff members, and to address our woeful instructional technology circumstances. So what has the Negative Factor done for Cañon City Schools? Our staff members are underpaid, though we have fewer of them. Our teachers are being asked to teach more kids, during a longer work week than all of our neighboring districts, in buildings and classrooms we can’t afford to properly maintain, while being unable to access up to date technology and instructional resources aligned to new state standards to support their work. This is not my vision for Cañon City Schools. I hope it is not yours. In the coming weeks I’ll do my best to explain why we are in this difficult situation, some recent attempts that have been made to remedy these problems, and what some solutions may be for the Cañon City School District in addressing the concerns.